When Hindy Weber Tantoco emailed me this picture of a pink studded gown, I knew right away that this was meant to be shared with our dear, Rebellious Brides. For my second wedding, I wore a pink gown--I didn't even think I was the type who would actually wear pink for my own wedding--but I was more concerned with the fit of the gown as opposed to the color so I went ahead with it. Some people think that the color pink is just "puke-worthy". On the contrary, Hindy's gown just proves, that pink as a color in itself is not wimpy--it's how the color is actually USED, styled, and designed that make all the difference. This gown may be in the girliest color ever imaginable--but it also looks very wicked. I love it! Very rebellious-worthy indeed! 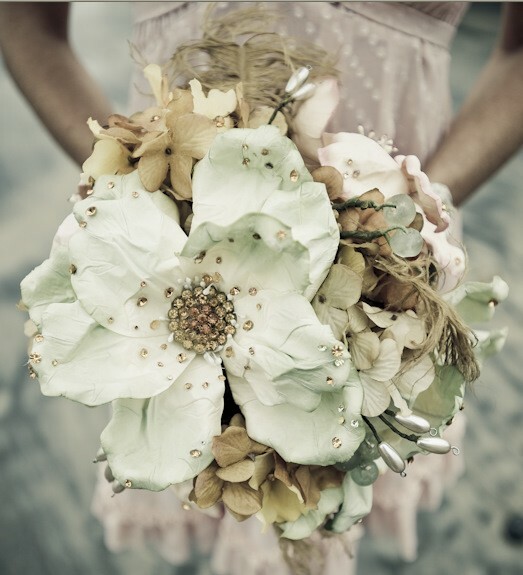 Check out this STUDDED BOUQUET! Absolutely loving this as well! How cool is a studded bridal look to balance out the girlyness and the rebelliousness? Or better yet, how about "studs" as a theme? You can even be "pilosopo" about it and ask your groom to wear a shirt that says "Stud Muffin". Studded cakes, studded invites...the list can go on! This is just a teaser of ideas that we can develop for your studded wedding! Are you interested to have a wedding consultant? Email us at rebellious.bride@gmail.com for more details. Please note that you may want to order 1 size up from what you wear. I ordered the XL for a size 13 wearer, and it was a little small, but thankfully, we are still able to use the dress.